ConArtists has a range of full-length shows to fit your venue or festival and we are keen to entertain you wherever you are. 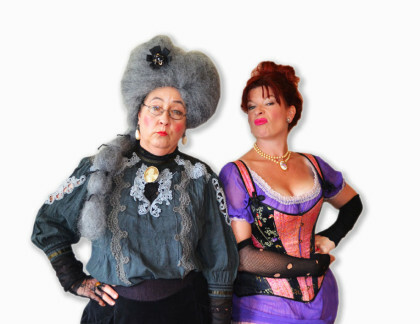 Contact us to talk through the details of how we can have your local audiences laughing at our inspired silliness. School workshops are also available. ConArtists are back to deliver Great Improvisations as they invent a brand new Dickensian theatrical every night. Mrs Plodswallop or maybe Mr Smigglesquelch will bring Victorian England alive, complete with urchins, prostitutes and gruel. You’ll be wanting some more as it’ll be the best of times….and the best of times. Hoorah! Grab lashings of Ginger Beer and prepare for Timmy to get Licky. Those Jolly Hockeysticks ConArtists, are back to improvise through a spiffing escapade in the style of beloved children’s author Enid Blyton. The Thrusting Three, The Silly Six or perhaps The Frisky Four will solve epic adventures involving pesky adults with the help of their good solid English Values and immensely sensible shoes. Oh, and they’ll probably eat some scones too. Warning: May contain grown men in shorts. A family Friendly comedy show that all ages can enjoy. Be drawn into the action as the actors weave your suggestions into comedy gold and maybe use your children as willing props along the way. Touring Party 4, with optional musician, 5.
resports teams will come to your school or hall and slug it out as they sing, rhyme and weave a yarn to get the highest possible scores. You provide the judges and audience and we’ll provide the non-stop comedy improv. Make an evening of it with a glass of bubbly and anti-pasto. A social event and fundraiser where everyone comes out on top.